The indigenous people of the Cape, the Khoena, did not give every river a name in the same manner as did the Europeans. There were simply rivers from which people could drink water and those from which people could not drink. The former were known as the Sweetwater rivers or Camissa rivers. A maroon group, the Goringhaicona establish the first proto-settlement at the mouth of the main Camissa river flowing from TableMountain into the sea. Caron von Zeil, a passionate environment champion of the Camissa water system whom I recently met has a Masters Degree in Environmental Planning and Landscape Architecture. She has established that the Camissa Sweetwater system recognised by the Khoena totalled 36 springs and 4 rivers. She has through her work uncovered 25 of the springs and 4 of the rivers hidden from sight through the many overlays of development. Like the heritage of the Camissa people, the Camissa water systems were also driven underground over the last three and a half centuries. Caron has found that in this process of being driven underground, the people of Cape Town are losing millions of litres of fresh drinking water daily. Caron thus started an initiative 8 years ago to Reclaim Camissa but at every turn in attempting to move forward with an innovative non-profit public benefit initiative blockages have been put in her way. It would seem that the City of Cape Town local government officials are the stumbling block and it would seem that some people somewhere in the council have smelt a business opportunity and wish to now rob this non-profit initiative of their years of work. Within Caron’s story, is a story of how Reclaim Camissa established a public benefit project called FIELD OF DREAMS at the site where she had found a number of springs. This would have been an environmental site of visitation and would have produced bottled spring water branded to honour the convergence of the water heritage and Khoena heritage and for the first time elevate the Khoena name, Camissa, to its rightful place in Cape Town. The Reclaim Camissa Trust shared their plans for the project with the City Council in applying for the use of the land, but then strangely through some sort of connections another organisation which had applied much later, were handed the land for a vegetable gardening project. It was clear that this was just a holding exercise. In the meanwhile the City Council has continued to entertain Reclaim Camissa and stall their efforts while quietly following a different path to try and get a water licence from the Department of Water Affairs, large based on exploiting Caron’s and Reclaim Camissa’s intellectual work. All organised Khoena cultural organisations are called to throw down the gauntlet and challenge the Cape Town City Council on this subterfuge. On the one hand the City government should show due respect for these pioneering people who have worked hard, not for personal gain as a Public Benefit NGO, to reclaim the water heritage of Cape Town and to resurrect the old Khoena name Camissa. On the other hand the original FIELD OF DREAMS project and the organised Khoena cultural movement should make common cause to ensure that there is at least one liberated zone in the City which become an unspoilt heritage site that speaks to the heritage of the Khoena in a very practical manner. Furthermore it is important that the name Camissa and the spring-water so named becomes a protected indigene Khoena inheritance and that any proceeds remains within the non-profit public benefit arena and does not go to the greedy ‘Self-enrichment Tjommie Brigade’. The Khoena cultural role-players must make strategic alliances with organisations such as Reclaim Camissa to ensure that advances are made through practical endeavours to bring our culture that was driven underground to once more rightful take its place in the City and make an impact. Bottled spring water from the Camissa water system, has the potential not only of ensuing that millions of litres of fresh water does not go to waste but also that the story of Camissa and the original Khoena of the Cape becomes widely known to all in South Africa and to all visitors to Cape Town. Reclaim Camissa is a registered Non-profit Trust No. IT 2882/2010. http://www.reclaimcamissa.org. CLICK THROUGH TO EXPLORE MORE ABOUT RECLAIM CAMISSA. Here follows the story as written by Cape Times Environmental Writer, Melanie Gosling, in the Cape Times 14 June 2013. 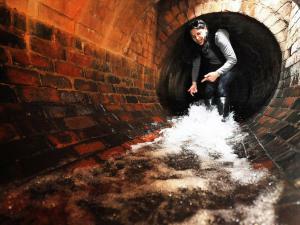 Cape Town – For eight years Caron von Zeil of Newlands has worked on Reclaim Camissa, a project that uncovered and documented the vast amount of fresh water that flows to waste underneath Cape Town. Her work has been cutting edge: most of the springs and rivers that flow from TableMountain have been paved over and forgotten, and every day millions of litres of fresh mountain water rushes away unused into drains or sewers. Since 2005 she has been trying to get the city council to endorse Reclaim Camissa. Today she is no closer to this goal – although several officials and councillors say her project is “great”. “They’re seeking to make this their own,” Dewar said. The council was asked for comment on Wednesday, but had not replied by deadline on Thursday. How can I help Caron? Part of the river flows underneath the Castle of Good. Please put me into contact with Caron to pursue the matter. Is this perhaps the reason why the City prefers to own dams and reservoirs in other Municipalities such as Drakenstein, Stellenbosch and Theewaterskloof? Environmental Emperialism? Thank you Brett. Appreciate your response. We should get the people of cape town involved….Martin Luther Style…we should take to the streets and make people aware of the reclaim camissa project. The water shortage affects every South African. Let’s meet and make this a reality. We will do it by the book to mostly raise awareness of the project and put some heat on our government. The drought in the Western Cape is severe. We face harsher water restrictions in a few days time. The City Council has done a fantastic job on communicating this to us. What I do not understand is why nothing has been done about the Reclaim Camissa Project. Why are they seemingly blocking it? what does Caron propose should be done? surely there are specialists in this field who can design some form of dam? Please direct the question to Caron. She has been fighting and engaging the City Council for years. Cape Town has a Dam in the city that is no longer in use, I think, and there is at least two Dams on Table mountain top as far as I know. Its up to the citizenry to pressure the City Council for answers about how our water resources are managed. Gavin it’s pretty obvious . If you get free water the city loses out on its revenue stream including their ” sewerage factor “. They will block it at all costs ! We have a free flowing river and 4 full wells on the Castle premises. The authorities are aware of them and we are willing partners to harvest it. I am sure the advertising campaign to save water is more than what it would cost to harvest this natural resource – right here under our feet…. With the ongoing severe drought, this is the most deplorable negligance from “The City that Works for You”. Yeah right! We are being told that water prices might go up by 50%, does that mean we have more water? I don’t think so! Will the increase finance the harnessing of our natural spring/river water? From what I read, I don’t think so! Yet there are those speaking of desalination plants, which seem totally unnecessary with all the natural water readily available. This is just unbelievable! So the city is actually perpetuating the scarcity scare syndrome and manipulating the citizenry. by the officials , It should not be in such a domineering way expressed on your website . People who wish top support your case , don’t want to be associated with the negativism and accusations expressed . Please stay with the facts , like on your old website. Rather give us more info about viability, case studies and budget plans on Water , Electricity, Tourism and Heritage . According to my sources of information although the Camissa project is a great concept for the community the volumes are simply way too low to justify the cost of infrastructure and implementation. Perhaps this is a mistaken concept but please advise for everyone’s benefit. To my knowledge it is under 2million litres per day which sounds like a lot but not if you are spending too much to clean the water and maintain the infrastructure. Please advise the actual volumes per day that were formally recorded? Presently the Council is exploiting around 5 million litres from the Orangezicht (2mil) and Newlands (2,8mil) Springs. The breweries are probably exploiting three times as much from the Newlands spring. Caron Von Zeil who is the world acknowledged water-expert on the Camissa systems 31 City Bowl Springs and over 69 Springs if one counts the Southern suburbs in monitoring just one tunnel (of 31) has shown a daily push into the sea of 8,8 million litres of treatable water that should be protected and harnessed. The City of Cape Town’s Xanthea Limberg tries her best to put spin on the Camissa project, but she has no expertise in this regard and is not being honest. Caron Von Zeil has always cautioned that because the CoCT dropped the Camissa System from its maintenance responsibilities in 1990 this has resulted in pollution of the Springs and that nobody should be drinking the Spring Water that needs to be treated for e-coli. Caron however has made a solid scientific case lauded internationally for protecting and harnessing the Cape Town water which can be used for many other uses than drinking as well. Her work shows that the City Bowl and immediate surrounds could successfully use this water and relieve other sources for other parts of the peninsula and surrounds. Various commercial interests exploit the Camissa system including breweries and soda drinks companies as does the City Farm project. The City has been irresponsible and dishonest about this entire matter over a long time. In 2009 both the City and the Province lauded the integrity of Caron Von Zeil and the Reclaim Camissa Project. Indeed the City and Cape Town Partnership won international acclaim as Design Capital of the World where Reclaim Camissa was one of the big five ideas that resulted in the award. You can approach Caron Von Zeil directly through Social Media for further facts… There is a Reclaim Camissa site on FB for more scientific details.